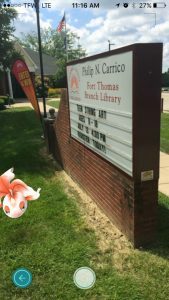 Good news, Pokemon Go players – our Newport Branch is a Pokestop and Gym, our Carrico Branch is a Gym and our Cold Spring Branch is a Pokestop. So, what does that mean? Our branches are hotspots for Pokemon. Stop by, catch a few Pokemon, use our free Wi-Fi and check out a book or two. 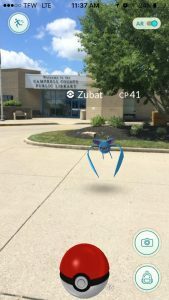 This Zubat was found outside our Cold Spring Branch. When you arrive, be sure to use our Pokestop. Look at the Goldeen we caught outside Carrico. 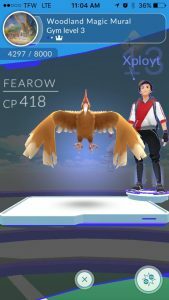 You can battle other players in our Gym. The mural in our Newport Children’s section is a Gym. 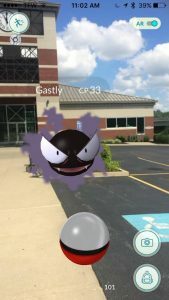 The Gastly was caught outside our Newport Branch. There’s a Gym and a Pokestop.